Against The Wall Debuts tonight on Lifetime at 10 p.m. Eastern. 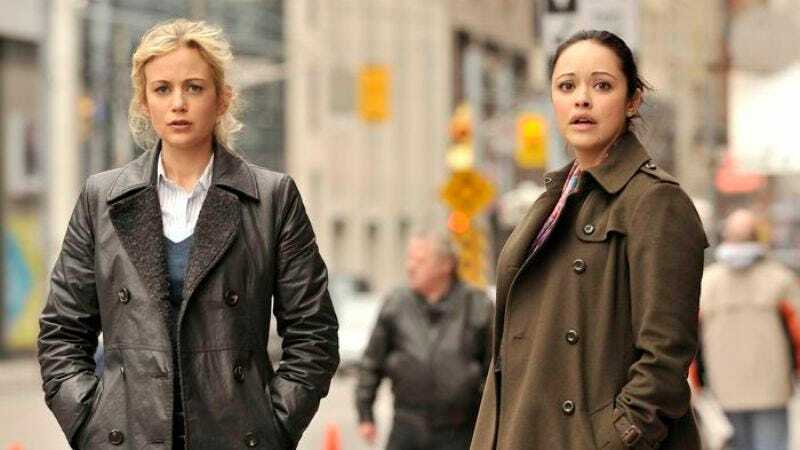 Between the Franklin & Bashes and CSIs and eating up the landscape, there might finally be enough procedurals to fill up every waking hour of television. But that doesn’t mean there aren’t still a few new angles left to approach the medium. Lifetime’s Against the Wall takes the format to an interesting place thanks to its high-stakes premise: After five years on the street as a cop, up-and-comer Abby Kowalski — and, yes, it’s set in Chicago if that last name didn’t tip it— is fed up waiting around for a detective position to open up and decides to nab the only available one… in Internal Affairs. While it's possible any cop could become a pariah for switching from a beat cop to an IA detective, it doesn’t help that Abby’s father and three brothers are all distinguished men in blue, too. Throw in a feisty new partner and some dating angst, and it’s off to the races for Abby. In the first episode, Abby (Rachael Carpani) jumps right into her first day on the job, meeting her aforementioned partner Luna Flores, who also happens to be six-months pregnant. Naturally, Flores is hardly the motherly sweetie looking to show Abby the ropes of the job and she’s all scowls and disapproval after hearing Abby views the IA job as a stepping-stone to a detective slot in Homicide. While her family ostracizes her for becoming a traitor, Abby soldiers on and tackles her first case alongside Flores. A cop has gotten into a bar fight that put a man in the hospital and it all doesn’t seem to add up. It's fair to say that given the overall amount of groundwork the first episode is attempting to cover, the first case gets eclipsed in a major way by Abby’s more-compelling personal drama. But we do see her make her first moves as a detective and show she is a promising, if not overly confident newcomer who isn’t afraid to yell, threaten, and charge through someone’s backyard to get information. It’s the real-life problems in Abby’s life that help make her character feel like more than just a pretty lady clopping around a city in heels, interrogating with zeal. Away from the family tension, we see her sink a promising date with a handsome lawyer who has been pursuing her, hear mention of a painful breakup from two years ago, and peek in on secret, late-night trysts with her brother’s partner. While her flaws and quirks are meant to be readily apparent to viewers, there are also some over-the-top flourishes that include claustrophobia, clumsiness that has her tripping and knocking things over and an obsession with the Bears. That Chicago-ness takes center stage in all kinds of visually appealing ways. The show is framed in gorgeous aerial shots of the Windy City and when she’s not inside her cozy apartment, Abby escapes it all by heading up to her stunning rooftop lookout with views of the glittery city lights— a far cry from the colder blue and grey lighting of shows like the New York-centric Law & Order. Hiding all traces of her Aussie roots, Carpani plays Abby as a believable, hometown girl without falling into a cartoon Chicago accent and makes her feel like the girl-proving-the-boys-wrong we need her to be for the show’s high stakes to pay off. And, hooray! It doesn’t hurt she cracked her very first case, which means she’s clearly pretty good at the job her family now resents her for taking. Though her mom is encouraging of the move away from all the boys in blue around them, Abby still has a rough path to carve out between pissy partners, disappointed family, and secret liaisons that could cause even more bad blood. While it’s a bit of a shame the overlap had to happen so quick out the gates, the episode ends on a high-drama cliffhanger: Abby’s next case is to investigate one of her own brothers for shooting a teenager during a chase.